Ritual, stone age, clay, bear paws from the Åland islands. About 8000 BC: Orrdalsklint and Långbergen in Saltvik, Åland Islands' highest peaks, started rising from the Baltic sea (then Yoldia Sea). Around 4000 BC: The oldest archeological finds to denote the presence of humans on the isles. They represent the Comb Ceramic culture. Around 2500 BC: Pitted Ware starts to appear in Åland. About 1800 BC: Finds from the Kiukainen culture (believed to be Uralic speaking) (fi:Kiukaisten kulttuuri) start emerging. Due to forebulge effect after the Ice Age icecaps melted, the area round Åland is rising at several millimeters per year. 12th century: Åland Islands occupied by Eric the Saint. 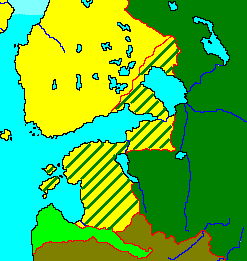 1284: Finland (including the islands) constituted a duchy. 1300–1600: Kastelholm Castle was a focal point for a number of battles and raids. 1323: Peace of Nöteborg. Finland and the islands incorporated in Sweden. 1397–1523: Union of Kalmar: Danish ascendency. 1581: Finland a Grand Duchy. 1714: The Islands conquered by Peter the Great. 1714–1721: Åland was attacked and devastated by Peter the Great's forces; most of the population fled at that time to Sweden. 1721: Peace of Nystad. Finland (excepting Vyborg) restored to Sweden. 1743: Peace of Åbo: part of Finland ceded to Russia. 1809 September – Treaty of Fredrikshamn: Finland and the islands ceded to Russia. The Swedes were unable to secure a provision that the islands should not be fortified. The question was, however, a vital one not only for Sweden but for Britain, whose trade in the Baltic was threatened. As the result of abundant Anopheles claviger mosquitoes, malaria was endemic in Åland for at least 150 years, with severe malaria outbreaks being recorded in the 17th century, and in 1853 and 1862.
c. 1835: Fortress of Bomarsund begun. 1854 – Battle of Bomarsund: during the Crimean War, an Anglo-French force attacked and destroyed the fortress of Bomarsund. The British prime minister Palmerston had protested against this fortification without effect some twenty years earlier. 1856 – Treaty of Paris: Convention forbidding the fortification of the Islands. March 1856: By the Åland Convention, concluded between United Kingdom, France and Russia, it was stipulated that "the Åland Islands shall not be fortified, and that no military or naval establishments shall be maintained or created on them." By the 33rd article of the Treaty of Paris 1856 this convention, annexed to the final act, was given "the same force and validity as if it formed part thereof", Palmerston declaring in the House of Commons on May 6 that it had "placed a barrier between Russia and the north of Europe." 1862: Another severe malaria outbreak. 1877: A telegraph cable is in use from Mariehamn to Nystad. 1892: The first telephone is installed in Mariehamn. 1906: Russian garrison established in the Islands. Some attention was attracted to the Treaty of Paris arrangement when it was asserted that Russia, under pretext of stopping the smuggling of arms into Finland, was massing considerable naval and military forces at the islands. 1907: France and Great Britain requested by Russia to cancel Convention of 1856. 1907: Secret Treaty of Björkö (Russia and Germany) giving Russia a free hand as to the Islands. 1908: Baltic Treaty. Declaration of Sir Edward Grey about fortification. 1907–1908: The question of the Åland Islands created some discussion in connection with the new North Sea agreements, and undoubtedly Russia considered the convention of 1856 as rather humiliating. But it was plainly shown by other powers that they did not propose to regard it as modified or open to question, and the point was not definitely and officially raised. 1914: Outbreak of World War I: Russia fortifies the Islands. 1916: The islands were remilitarised by Russia and used, among others, as a submarine base during World War I. 1917 – Russian Revolution: Finland declared independent. The Islanders by plebiscite (25–29 December) demand reunion with Sweden. 1918: Independence of Finland recognized by Soviet Government, Sweden, and Germany. Bolshevik force landed in the Islands. Swedish military expedition (February). Germany occupies the Islands (march-October). 1918: Appeals of islanders for reunion with Sweden – to Finland, Germany, and Sweden (March); to United States, France, and Great Britain (November 9); to Finland (November 18). 1919: Swedish Government brings the question before the Paris Peace Conference (March 18). 1921: The Åland Convention re-established the demilitarised status of the islands. ^ Prothero, G.W. (1920). The Åland Islands. Great Britain. Foreign Office. Historical Section. p. 9. ^ a b c Prothero, G.W. (1920). The Åland Islands. Great Britain. Foreign Office. Historical Section. p. 3. ^ a b Prothero, G.W. (1920). The Åland Islands. Great Britain. Foreign Office. Historical Section. pp. 9–10. ^ Prothero, G.W. (1920). The Åland Islands. Great Britain. Foreign Office. Historical Section. p. 6. This article incorporates text from a publication now in the public domain: Chisholm, Hugh, ed. (1911). "Åland Islands" . Encyclopædia Britannica. 1 (11th ed.). Cambridge University Press. p. 469. This article incorporates text from a publication now in the public domain: Prothero, G.W. (1920). The Åland Islands. Great Britain. Foreign Office. Historical Section. pp. 9–10. Sund is a municipality of Åland. It is an autonomous territory of Finland which is very rich in history and culture, being one of the official 27 National landscapes of Finland. The Åland Museum & Åland Art Museum is a museum in Mariehamn in the Åland Islands, Finland. It is located in the eastern part of the town, about 200 metres from the harbour. Along with Åland Maritime Museum it is the most important museum in the islands. Both the main museum and the art museum are housed in the same building. The art museum of the museum is referred to in the Swedish language as the "Konstmuseum".